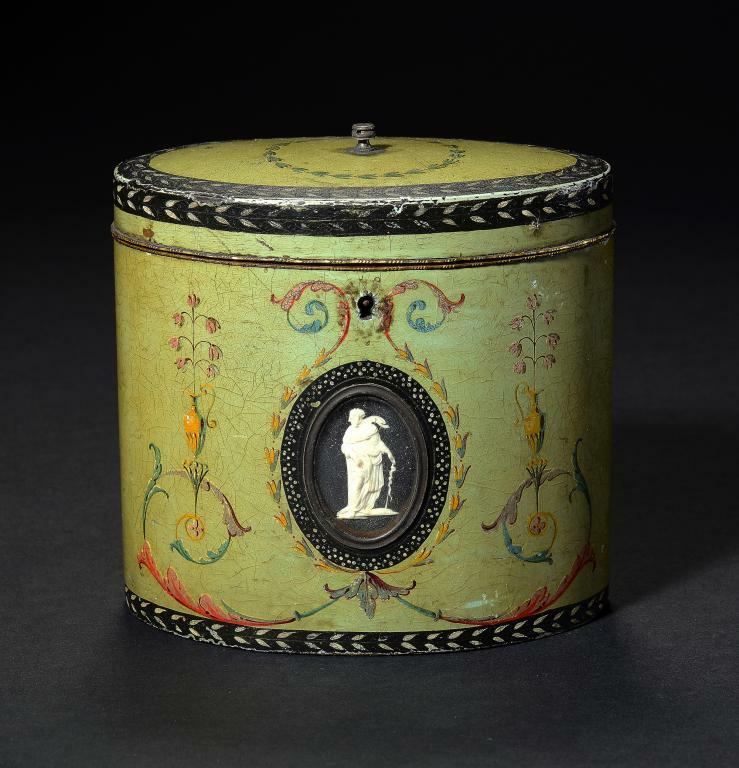 A GEORGE III POLYCHROME DECORATED PAPIER MÂCHÉ TEA CADDY ATTRIBUTED TO HENRY CLAY, C1780 inset with two Wedgwood jasper ware cameos, one of Aesculapius, the well preserved painted decoration in the manner of Robert Adam, giltmetal mount, the interior with the original laminated papier mâché cover, 12cm hHenry Clay of Birmingham, Japanner in Ordinary to His Majesty and His Royal Highness the Prince of Wales was the pre-eminent manufacturer of papier mâché goods in the late 18th century. The present caddy conforms to his 'New Improved Paperware' Patent of 1772, being of laminated construction, as distinct from the traditional papier mâché method.The Wedgwood cameos are original and an example of that of Aesculapius is illustrated Reilly (R) Wedgwood, 1989, vol II, fig 1227. 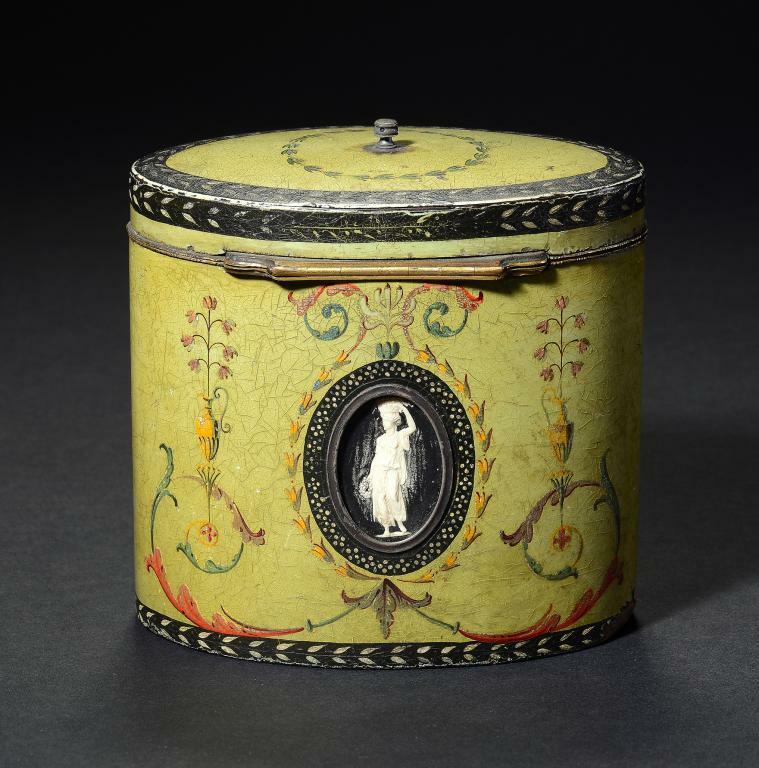 Wedgwood's biographer, Eliza Meteyard (1816-1879) described Henry Clay as "a most ingenious cabinet-maker of Birmingham, [who] was at this time doing much for Wedgwood's fame, by inserting the cameos in tea caddies, writing desks, dressing cases and similar articles.... These signs of Clay's exceeding taste and ingenuity induced [Matthew] Boulton to suggest a partnership, but Clay for some reason declined. "It is not known whether the present caddy is marked as the slightly recessed foot is still covered to a large extent with what could be the original coarse green baize. Other examples are illustrated Gilbert (C), Marked London Furniture 1700-1840, Leeds 1996, figs 201 and 202. An example set with jasper ware cameos but decorated with a dusted ground is illustrated Jones (Y), Japanned Papier Mâché and Tin Ware, Woodbridge 2012, fig 116. Another example, almost identical to the present lot, was sold Bonhams, London, 6 March 2013, lot 103.